Reader Praise for WHO’S AFRAID OF THE DARK? Readers loved “Who’s Afraid of the Dark?” when it was part of Make Death Proud to Take Us. Since we released it standalone, even more praise has come in. Here’s a sample of what the readers have to say. I’m really not sure how to review this short story without revealing any of the surprises in it, so let me apologize in advance for this review being a little oblique, but since I’ve already given away that it’s not simply what it seems, let me emphasize that it’s *really* not what it seems at first: it’s quite a lot more. I had forgotten how satisfying a good fantastical short story could be… It reminded me of a good Twilight Zone episode. The story features subtle, evocative imagery about the monsters and hints about the boy’s family strife. Good on the author for not overdoing any of this and maintaining the child’s POV. Recommended. I love the story of someone overcoming the things that challenge them. I’m anxiously anticipating more adventures with Bishop, and can’t wait for Newquist to reveal his origin story. The anxious anticipation is nearly over! Although Post Traumatic Stress is not, strictly speaking, a Peter Bishop novel, it does actually feature his origin story as the b-plot. The first draft of the novel is now 90% done, and it’s coming together rather quickly at this point. I expect to have the manuscript off to my editor sometime in November. God willing, we’ll have the novel published sometime around the first of the year. In the meanwhile, the second Peter Bishop story, “Knight of the Changeling”, is already available as part of the anthology Between the Wall and the Fire. We’ll also be releasing it soon as a standalone story. 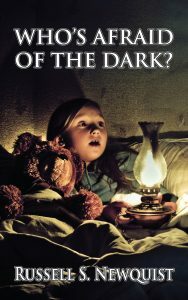 Meanwhile, “Who’s Afraid of the Dark?” is available DRM-free for the bargain price of $0.99 on Amazon.com, or free for Kindle Unlimited subscribers. Little Johnny isn’t afraid of the dark. Big boys aren’t afraid of the dark – and at five, Little Johnny is a big boy. No, he isn’t afraid of the dark. He’s afraid of the things that come out in the dark, and what they might do to his baby sister. But his parents don’t believe him – so it’s up to Johnny to keep her safe, armed only with his toy sword and shield. Peter Bishop had a simple life. He had friends he liked, a church he loved, and a job that he actually kind of enjoyed. He didn’t want much more. Maybe just a nice girl to settle down with. OK, maybe just one specific girl. And then again, maybe she wasn’t as nice as he thought she was. And maybe she wasn’t all that into him, either. Yes, Peter Bishop had a simple life. Until a demon attacked his town, his friend Michael joined an ancient band of knights, a dragon kidnapped the girl, and a seventy three year old monk gave Peter the sword of an archangel. Peter’s life is not so simple anymore.